I am nearly always disappointed in my Yorkshire puddings. Disappointed to the extent that I very rarely make them. I have a sneaking suspicion that it is something to do with having a gas oven, as I have made amazing, towering, magnificent Yorkshire puddings when using someone else’s kitchen and electric oven. So for now I simply do not make them when I am at home. Despite their name Yorkshire puddings are usually served with a roast – and for me they are an essential addition to a joint of beef, although for some reason I do not tend to make them when roasting other meats. 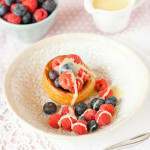 In a bid to emulate the American tradition of popovers* – which are mini Yorkshire puddings, baked in a straight sided muffin pan and risen to towering magnificence – and usually served sweet I have used the classic combination of frozen berries and white chocolate sauce to fill a piping hot Yorkshire pudding. A perfect light, low effort pudding for Mothering Sunday this weekend. 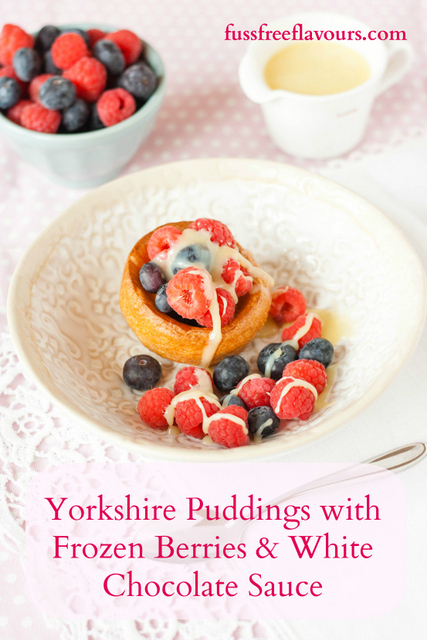 I used Aunt Bessie’s ready made frozen Yorkshire puddings here and was astonished at how good they are. Thin, crispy and light and ready after just 4 minutes in a hot oven. Really really very good indeed and certainly one to try if you, like me, are disappointed by your home made Yorkshire puddings. If you try this Yorkshire Puddings with Frozen Berries & White Chocolate Sauce please tag #FussFreeFlavours on Instagram or Twitter. It is amazing for me when for me when you make one of my recipes and I really do love to see them. You can also share it on my Facebook page. Please pin this recipe to Pinterest too! Thanks for reading Fuss Free Flavours! Preheat the oven as per the packet instructions. Gently heat the cream in a small saucepan to a gentle simmer. Remove from the heat and add the chocolate. Stir well and let it melt into the cream. Whilst the chocolate is melting, pop the Yorkshire puddings into the oven for 4 minutes to cook. Once the puddings are ready, serve immediately filled with the berries and drizzled with the white chocolate.